But what an incredible difference it has made in my life! I’ve gone from feeling like life just happens to I can make life happen – the way I want! And while I don’t believe we can ultimately have control of everything in this life, I have begun to believe that I have far more say in how my life turns out than I ever believed. It’s easy to say ‘I’ve gotta do that”, or “I need to spend more time” or “I’m going to treat myself better...sometime”. And more often than not, sometime becomes never. Unless we specifically set a time, or a place; unless we be intentional about making that ‘thing’ whatever it is, happen, most likely it never will. And what ends up happening, when we break promises to ourselves, is we stop believing that we have any power over our lives at all. 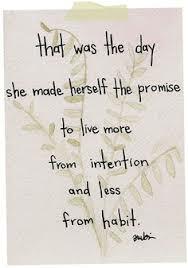 So, what one intention will you set today that will make your life better – that will in some way honor you? Set one, speak it out into the universe, and do it! I dare ya!